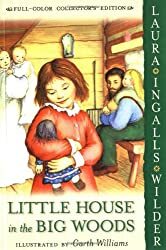 This is part of a readalong of the Little House series I am organizing on an internet forum I moderate. One of the reasons I organized the readalong was to see if they were as good as I remembered, but also to look critically for things. Rose Wilder wrote a lot of these books with her mother, and her political views are sprinkled throughout. Secondly, reading between the lines, a lot of other readers wondered if Pa Ingalls as that good of a family man after all. This book was more boring than I remembered. Actually, maybe this book is so idyllic, it edges onto tedium. I did enjoy some aspects, particularly the food parts: butchering, cheese-making, butter churning, maple sugaring, and more. I like the hunting moments, Christmas family moments, and Ma making hats. The ending is sweet too. Some of the stuff I wasn’t loving was the punishments, spankings for birthdays, and the rivalry between Mary and Laura in general was a bit discomforting. I didn’t like how they wrote about how Laura was not noticed because of her brown hair and curls: “They were ugly and brown.” Poor Laura. Why did they move? I don’t know how the woods were so crowded when Laura and Mary had never even seen two houses together let alone a town or a store. All in all, this was a lackluster start. It had its moments. I may consider it for children’s reading. Reread August 18, 2014 on Kindle. Yes! It’s one of the reasons we’ve been scrutinizing the books. There are disparities between the novels and her memoirs, but we’re not sure how drastic really. Thanks, Susan!